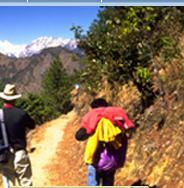 Personal Equipment Check List For All Treks For Treks Going Above 4000m . Optional Equipment. If you have a porter, you will need a duffel bag with a padlock, some stuff sacks and lots of plastic bags. A small duffel bag or suitcase to leave your city clothes in is also useful. The most prominent ethnic groups in the annapurna region are the Gurung, Braman, chetri, Thakali and the Manangba.